From left, Turkish Foreign Minister Mevlut Cavusoglu, left, and U.S. Secretary of State Mike Pompeo are pictured prior to a meeting of NATO foreign ministers at NATO headquarters in Brussels, April 27, 2018. Turkish Foreign Minister Mevlut Cavusoglu is heading to Washington to meet with U.S. Secretary of State Mike Pompeo. The two-day visit starting Sunday seeks to resolve bilateral tensions between the NATO allies. Topping the agenda will be Washington's support of the Syrian Kurdish YPG militia in its war against the Islamic State group. Ankara calls the YPG terrorists, accusing the militia of being linked to a Kurdish insurgency inside Turkey. "[The United States] has preferred to collaborate with a terrorist organization in Syria. That was a grave mistake, and we are trying to change their position," Cavusoglu said Saturday. The foreign minister went on to warn Washington of how high the stakes have become. "Nobody wants to lose such an ally [Turkey]," he said. "And if one does, it will damage them [the U.S.], not us. We are not without options or alternatives, and we don't need anyone else." Analysts say what Cavusolgu means by alternatives is Russia. To Washington's alarm, as relations have plummeted with its NATO ally, Ankara has been deepening its ties with Moscow. The Turkish Foreign Ministry said Cavusoglu's talks in Washington would focus on a "road map" for the Syrian town of Manbij. Manbij has become the epicenter of Turkish-U.S. tensions. The town was seized by mainly YPG forces with U.S. backing from Islamic State. Ankara claims Washington reneged on an agreement that the militia would withdraw after taking Manbij. FILE - In this April 4, 2018, photo, a U.S. soldier sits on his armored vehicle on a road leading to the tense front line in Manbij, Syria. The tensions over Manbij have threatened to turn into a confrontation. 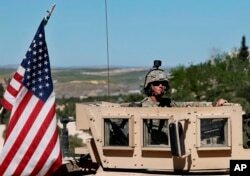 U.S. Special Forces are working with the Kurdish militia in Manbij, while Ankara has repeatedly warned it was ready to use force to oust the YPG. However, analysts suggest there is cause for cautious optimism. "I see that there is a common understanding when it comes to Manbij," said former senior Turkish diplomat Aydin Selcen, who served in Iraq and Washington. The Turkish Foreign Ministry is claiming a deal has been reached, but the State Department says talks are continuing. Analysts suggest Washington's caution is because any deal over Manbij is likely to be tied to resolving other differences. "It will be a whole package," Selcen said. Iran is expected to be a crucial part of talks between Cavusoglu and Pompeo. Given Turkey's growing military presence in northern Syria, including the critical Idlib province, some analysts suggest Ankara could be vital to Washington's efforts to curtail Iran's influence. Ankara is likely to be wary of Washington's effort to confront Iran in Syria. "Iran is an important player, and Iran's contribution is needed if some normalcy is to return to Syria," said Sinan Ulgen, head of the Istanbul-based Edam research organization. "So Turkey does not want Iran to be pushed into a corner, into a much more confrontational environment that is generally seen as an unwanted scenario for the region." FILE - A customer uses an automated teller machine at a branch of Halkbank in Istanbul, Aug. 15, 2014. However, Washington does have considerable leverage over Ankara. "Turkey will be cornered," political scientist Cengiz Aktar said. "The United States has a very big stick in its hands with the Halkbank case." The Turkish state-owned Halkbank is facing a potential multibillion-dollar fine from U.S. regulatory authorities after a New York court convicted one of its senior employees of violating American sanctions on Iran. Analysts warn a substantial penalty could threaten Turkey's fragile financial system. However, Pompeo could have other objectives. "There is Pastor Brunson, the purchase of S-400 missiles, so I am not of the opinion the U.S. will try to wring the arm of Turkey against Iran, to try to involve Turkey in direct military action against Iran," said Selcen. During his talks with Cavusoglu, Pompeo is likely to push for the release of U.S. Pastor Andrew Brunson, jailed for 18 months and on trial on terrorism charges. The case has been condemned as baseless by U.S. President Donald Trump. Ankara insists it's a matter for the courts. Among the charges faced by Brunson is supporting the U.S.-based Turkish cleric Fethullah Gulen, blamed by Ankara for 2016 failed coup. Cavusoglu is expected to press Pompeo for the extradition of Gulen. Pompeo also is likely to raise Ankara's purchase of a Russia's S-400 missiles, deemed by NATO as a security threat to its military systems. Analysts suggest a compromise could be in the offing whereby the missile system is isolated from NATO equipment. Observers point out despite the continual anti-U.S. rhetoric by Turkey's political leaders, cooperation with the U.S., especially in intelligence, is continuing. That rhetoric heated up last month when the Turkish interior minister, Suleyman Soylu, accused the U.S. ambassador to Afghanistan, John Bass, of being behind a surge in Afghan refugees and narcotics smuggling into Turkey. "To my mind, the U.S. is ready to live with that anti-American rhetoric, as they have other priorities in the region. They see rightly that Turkey is an indispensable partner to do business [with] in the region. But the relations between U.S. and Turkey are transactional. It is not realistic to talk about strategic partnership," Selcen said.